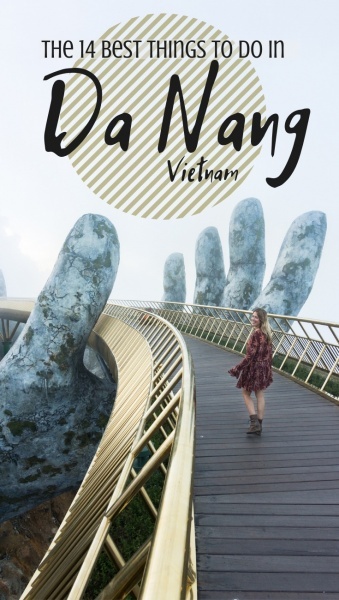 Da Nang is a large, bustling city that offers spectacular mountain views, white sandy beaches, and plenty of activities to keep adults and kids entertained for hours! You’ll need at least 3 days in the town of Da Nang to explore all of the highlights – and even more to spend time relaxing at your luxurious beach resort! Read on to learn all about the highlights of Da Nang to help you plan your upcoming trip. Da Nang is located in Central Vietnam and is home to the third busiest airport in Vietnam – Da Nang International Airport (DAD). The low cost domestic airline, Vietjet, operates numerous flights into and out of the city each day. Trains and buses are also available if you prefer to travel by land from Ho Chi Minh City or Hanoi but the distance is quite far. Tourist buses in Vietnam are generally “sleeper buses” that are double decker and all of the seats are in a reclining position. If you are very tall or would rather not be forced to recline, confirm the bus type before you book your tickets or plan on taking the train. You’ll find that Da Nang is the driest and has the most pleasant temperatures from February until April. The hot/dry season in central Vietnam lasts from April until October with the high temperatures ranging from 95 – 104 °F. July is generally the hottest month of the year and during these summer months the midday heat can be unbearable. The winter months are cooler and you can expect some rainfall from September until January. There are generally typhoons during the month of November so it’s best not to plan your trip during that time frame. The best way to see all that the city of Da Nang has to offer is by motorbike. 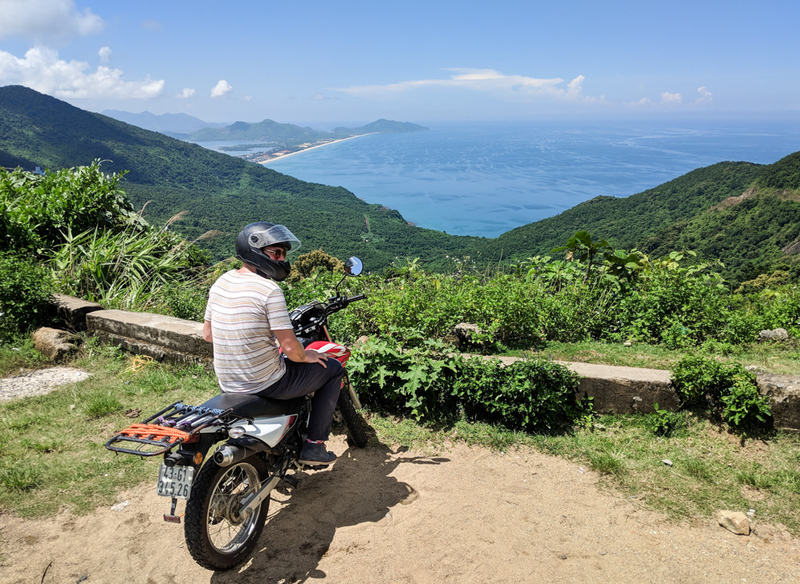 And because most of the area surrounding Da Nang is mountainous, you’ll find that a more powerful bike is better suited for this region of the country. We rented a Honda XR motorbike from Tigit Motorbikes and had no issues navigating the steep incline to get to the top of the Hai Van Pass. Grab is also a convenient way to get around the city of Da Nang. It’s the Uber of SE Asia. Just download the app on your phone and select your pick up and drop off points. Keep in mind it often takes longer than hailing a taxi, and the drivers occasionally cancel the ride, but it’s far easier than having to negotiate your taxi fare prior to departing. And it’s much cheaper! You can load your credit card info or opt to pay cash for each ride. You’ll rarely pay more than a few dollars to get around the city. Seafood is prevalent in Da Nang and the best place to get fresh, delicious seafood is La Plage. This beachfront restaurant inside the Sheraton Grand Danang Resort offers a casual atmosphere with gorgeous views of the sea. Their Signature Seafood Basket is not to be missed! Taco Ngon has a very modest menu – 3 meat choices and 3 topping choices. And all come in taco form. The concept is incredibly simple but the flavors are unlike any Mexican food you’ve ever tasted before (that’s because it’s not, the chef is actually Taiwanese. We tried them all and the pork with wasabi coleslaw was the shining star. We were excited to encounter another delicious Mexican restaurant in Da Nang – Tacos Danang. While we love Vietnamese food, we often crave a little variety when traveling and we were happy to chow down on yummy nachos, quesadillas, and margaritas at this cute little restaurant. 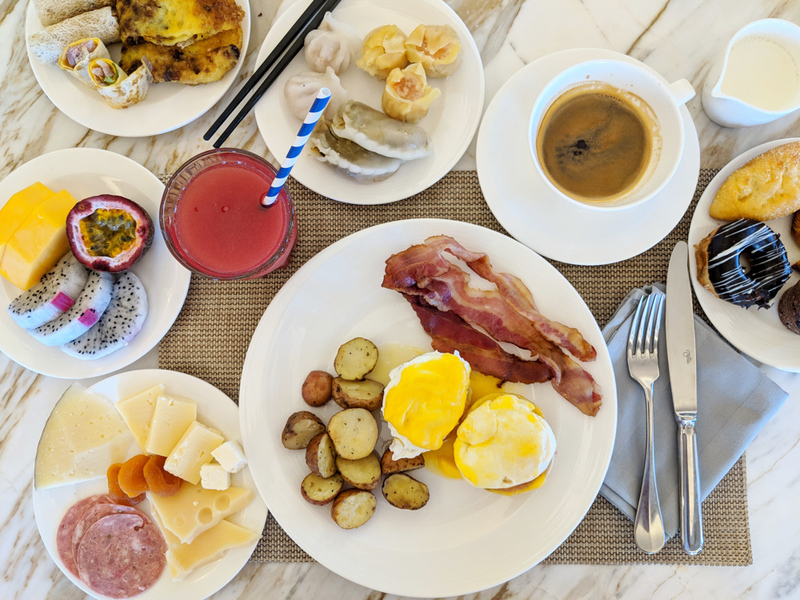 Happy Heart Cafe is a darling spot to enjoy breakfast and a cup of coffee during your trip to Da Nang. Fresh salads, wraps, crepes, pizzas – no matter what you order you can’t go wrong! Is it strange that in the 3 months I spent touring around Vietnam my all-time favorite place to eat was a pizza restaurant? Yes, yes it is but seriously, Pizza 4P’s is really that good. Their reasonably priced cheese platter is the perfect starter to one of their delicious wood-fired pizzas. The combinations are unique and oh so enticing – get the half and half option so you can sample more than just one! 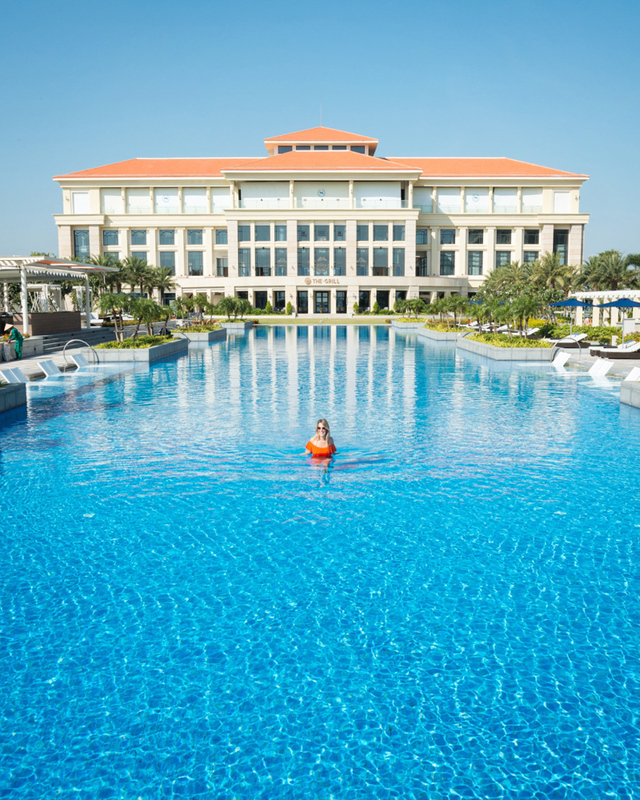 The Sheraton Grand Danang Resort is a stunningly beautiful 5-star property located right on the Non Nuoc Beach. The resort features 258 spacious and impeccably decorated rooms, a state-of-the-art fitness center and relaxing spa, 6 food and beverage venues, and a gorgeous outdoor pool. In fact, at 820 feet in length, their pool is the longest infinity pool in Vietnam! 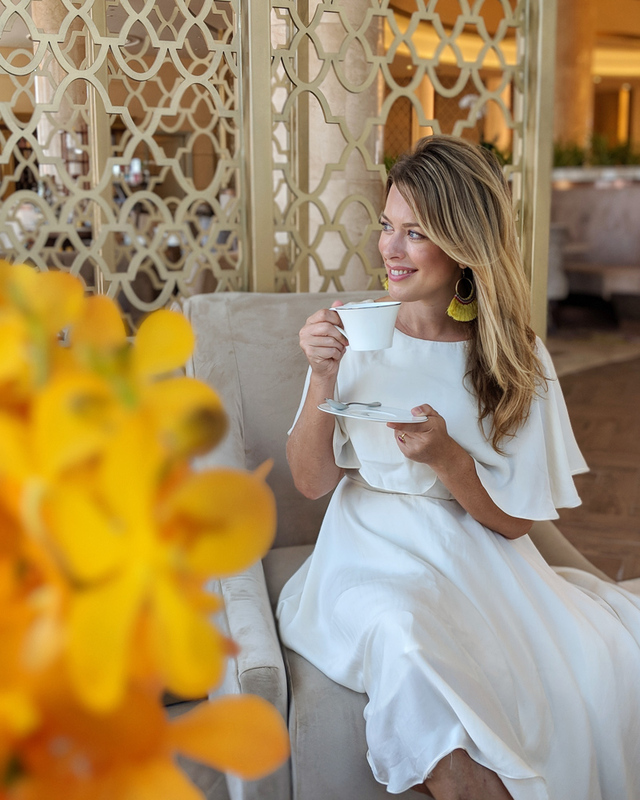 The Sheraton opened its doors in January of 2018 so everything inside and out has gorgeous, modern decor that is sparkling new! You’ll find the staff to be incredibly kind, helpful, and courteous and you’ll appreciate the small touches like a delicious welcome drink and a cold towel to freshen up. The beds at the Sheraton are so plush and comfortable, you won’t even want to get out of bed in the morning! But you should, because the buffet breakfast spread is spectacular. You’ll find everything from Vietnamese specialities to sushi, dim sum, fresh cheeses, warm pastries, and everything in between. Good thing the resort also has a fitness facility because you’ll most certainly be going back for seconds and thirds. 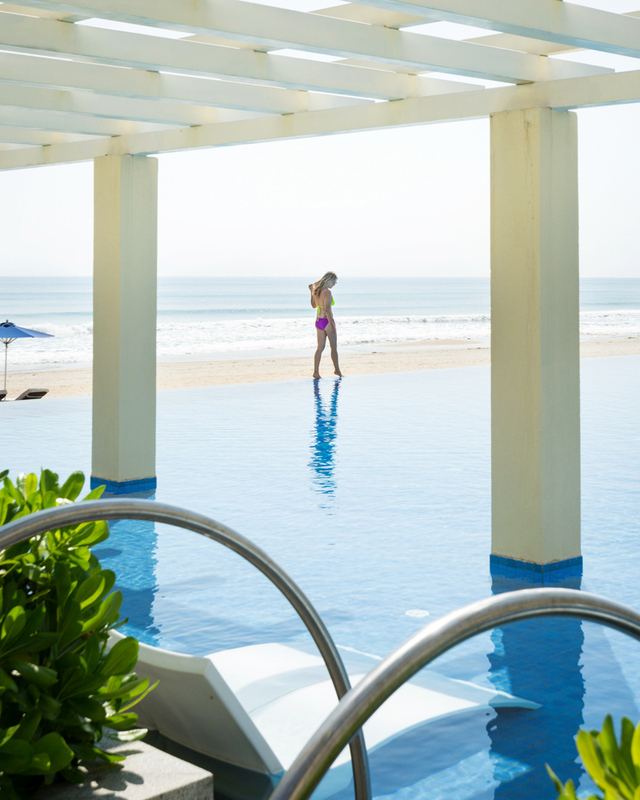 After breakfast you can spend the day relaxing at the infinity pool that overlooks the pristine Non Nuoc beach. And end your day by watching the amazing sunset while enjoying a beer at their beachfront restaurant. From 5pm – 7pm they offer discounted “sundowner” drinks. 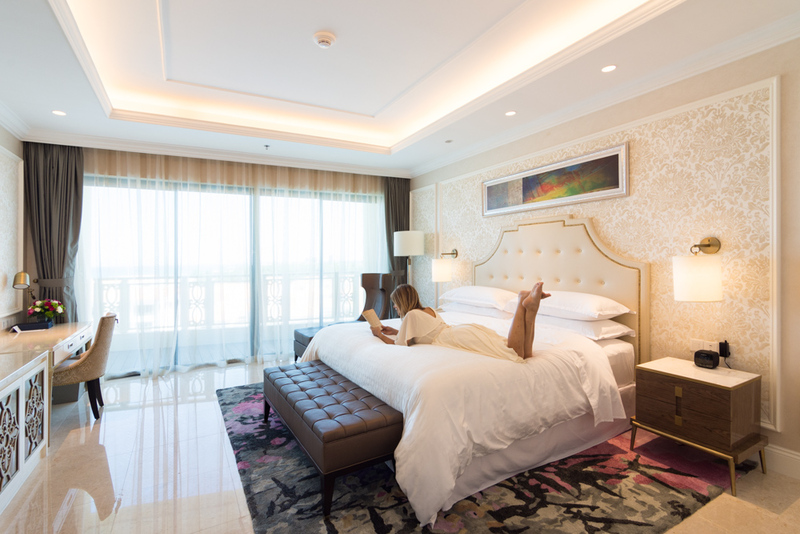 You are guaranteed to have an amazing, luxurious, and relaxing stay at the Sheraton Grand Danang Resort! My Khe Beach is a gorgeous stretch of coastline that stretches from the base of the Son Tra Peninsula to the Marble Mountains and is just a short 3 miles from the city center of Da Nang. This white sandy beach has calm, clear water that is perfect for swimming. There are plenty of lounge chairs available for rent and you’ll love relaxing with a book in one hand and a cocktail in the other. Non Nuoc Beach is south of My Khe and is filled with cute beachfront restaurants, luxurious resorts, and two international golf courses. It’s a bit further from the center of the city but you probably won’t want to leave your lavish beach resort anyway. Non Nuoc is far less crowded than My Khe so your lounging experience will be far more peaceful. The lavish Sheraton Grand Danang Resort is on Non Nuoc Beach! There are several exhilarating water activities available for a charge at My Khe Beach. You can rent a jet ski or see the view of the coastline from above in a parasail. Adults and children alike will have plenty of fun water sport options to choose from. And if you stay at the Sheraton Grand Resort Danang they offer sailboat and winder surfing instructions for any experience level. Or you can simply rent a kayak, stand-up paddle board, or a surfboard and enjoy the ocean without an instructor. There are several remarkable bridges that you should visit during a trip to Da Nang. 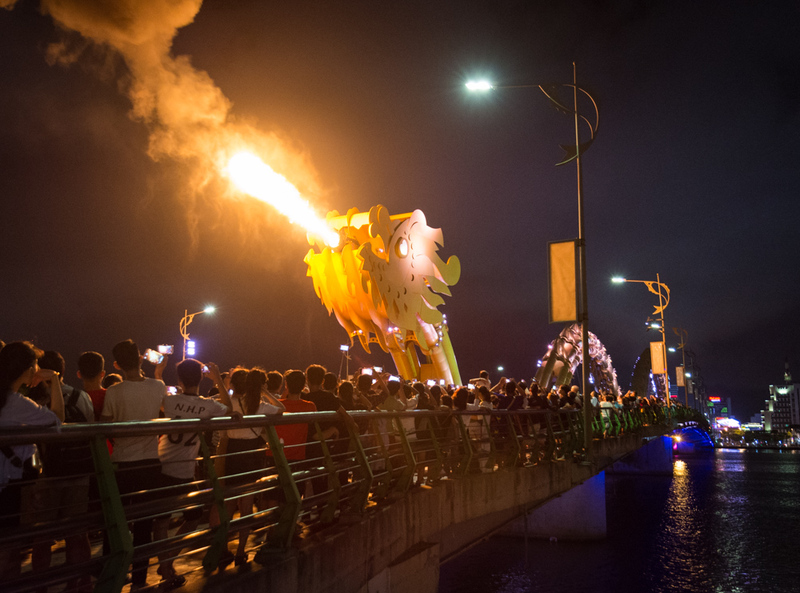 But arguably the most impressive is the Rong Bridge which is 545 feet long, constructed of steel, and is in the shape of a massive fire-breathing dragon. And it actually does breathe fire – every Saturday and Sunday evening at 9:00pm sharp. The waterfront area surrounding the head of the dragon starts to get crowded at around 8:30pm, especially right on the bridge. So if you would like to have an unobstructed view, plan on arriving early to secure a spot. The dragon bridge breathes fire twice, each time separated by about 2 minutes. And then it breathes water twice, again separated by about 2 minutes. Depending on the wind direction, if you are standing on the bridge, prepare to get soaked. The fire display is unique and not to be missed during your visit! 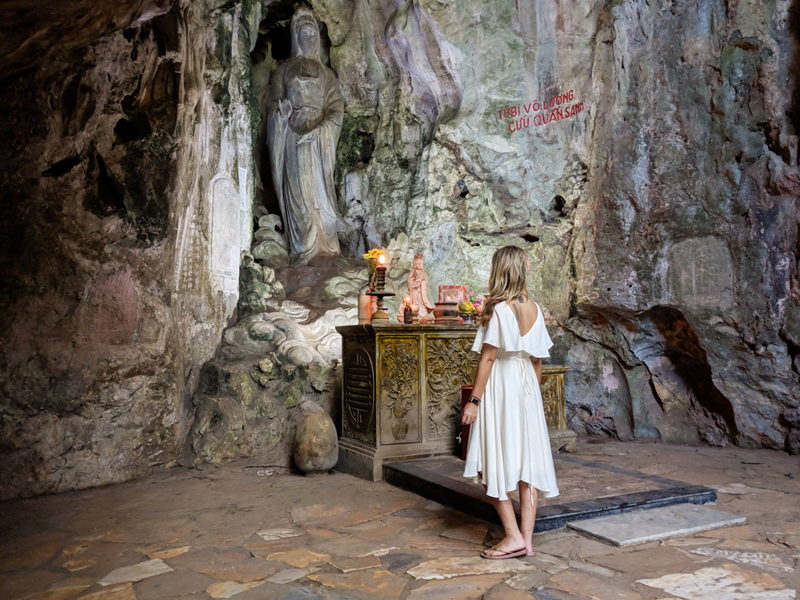 The Marble Mountains are located about 20 minutes south of Da Nang, towards Hoi An. This area is made up of 5 marble and limestone mountains, each named for an element. They are: Thuy Son (water), Kim Son (metal), Moc Son (wood), Hoa Son (fire), and Tho Son (earth). All 5 of the mountains have interesting natural caves and tunnels to explore, as well as Buddhist temples built into them. Thuy Son Mountain is the most popular and it’s a steep 150 steps to the top. If you’d rather not make the climb there is also an elevator that you can take. Here you’ll find 3 caves and a secret “road to heaven” where you can hike through one of the caves to the peak where spectacular views await. There is a trail that leads down from the top if you’d rather not go back through the cave. But be sure to arrive early to beat the heat and the crowds. The marble rock inside of the caves is quite slippery so shoes with traction are recommended. Han Market and Con Market are both good options if you are looking for designer knock-offs or souvenirs to bring back home. Be prepared to negotiate prices. 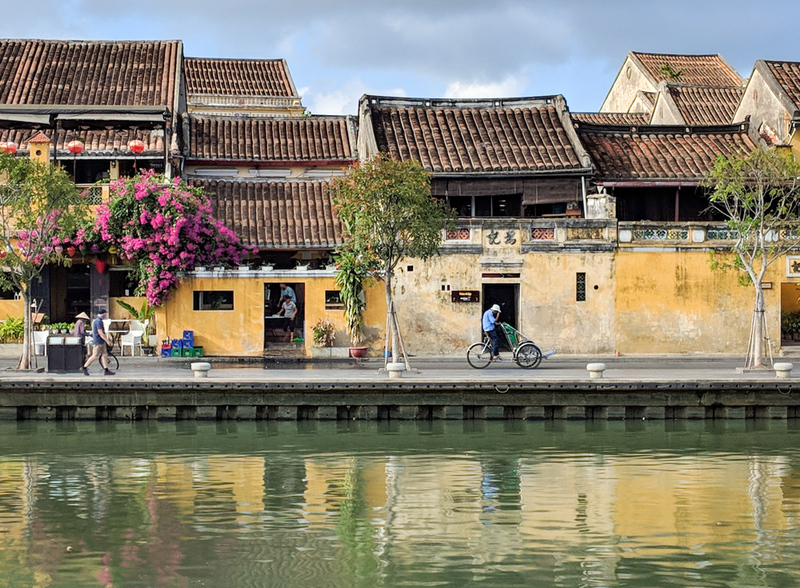 Common treasures to purchase from Vietnam include: colorful lanterns that light up the town of Hoi An, lacquerware, straw purses, silk robes, and wood carvings. If you are interested in purchasing a marble statue, there are plenty of shops around the entrance to Thuy Son Mountain selling impressive marble (and resin) statues of all shapes and sizes. The Sun World Resort in the Ba Na Hills is home to the now famous Golden Bridge. 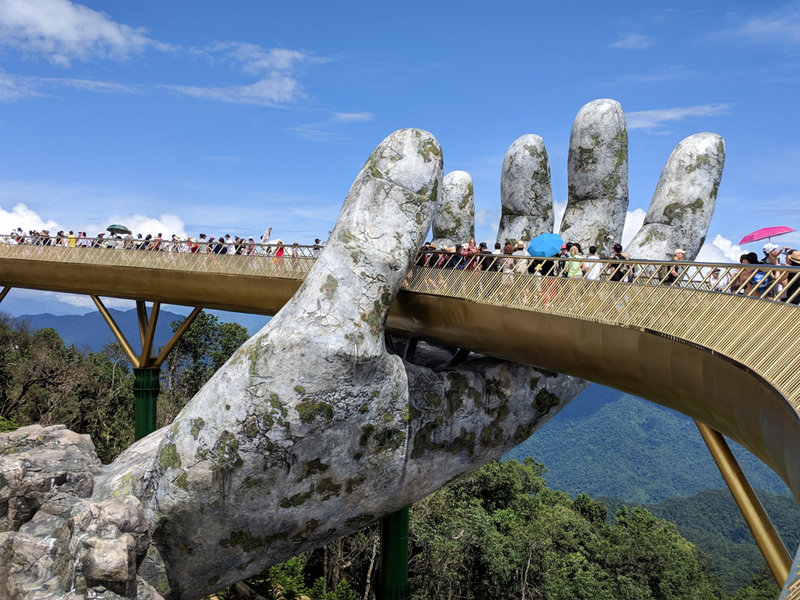 Construction was completed in 2018 and already visitors are flocking to photograph this bridge that appears to be held up by two massive, ancient hands. A cable car will take you up to the massive resort that sits in the hills, 4,800 feet above sea level. The Sun World complex includes not only the Golden Bridge but also a French village, a wine cellar, multiple impressive temples and pagodas, an alpine slide, a fantasy park, a funicular, and multiple restaurants serving up food from all over the world. Read all about what to expect during your day trip to Sun World Ba Na Hills here! The Son Tra Peninsula (aka Monkey Mountain) is located just outside of Da Nang’s city center. In fact, when you are lounging on My Khe Beach you can see the majestic Goddess of Mercy, an impressive 228 feet in height, from across the bay. This peninsula has a conservation order that has kept it from getting over-developed so you’ll get to enjoy it’s unspoiled natural beauty. The total road trip is about 25 miles, about 10 of which crosses the Son Tra Mountains. As with the Hai Van Pass, you’ll also want a more powerful motorbike to make this journey, especially if you plan on riding double. There are several religious monuments on the peninsula. Ling Ung Pagoda is a significant pilgrimage destination for Buddhists and the Goddess of Mercy statue to a symbol to protect the coastline from rough seas. The peninsula also has numerous beautiful and unspoiled beaches including Buddha Beach, Bai Rang Beach, Bai Nom Beach, and Bai Nam Beach. If you stop at the religious monuments and take some time to relax on the beaches, this trip will take you most of the day. 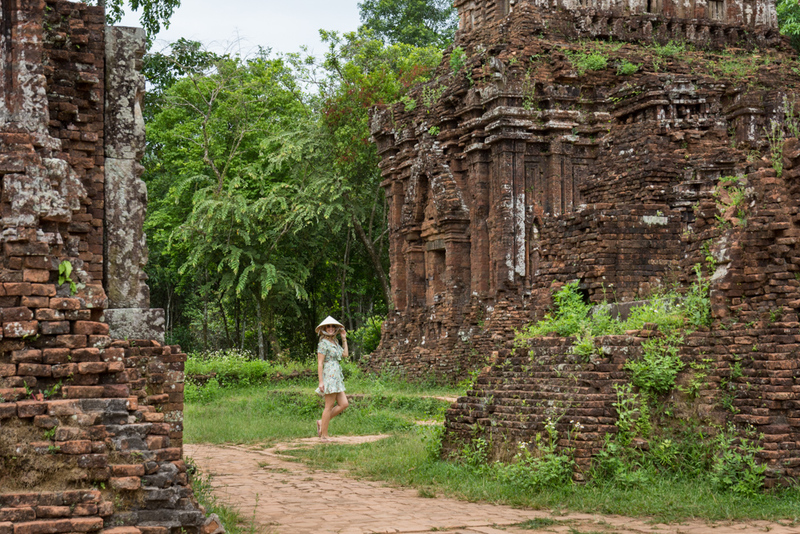 The ancient Mỹ Sơn Ruins are just west of Hoi An and about an hour drive from Da Nang. It’s easy to do as a day trip from either Hoi An or Da Nang. Mỹ Sơn was the religious and political capital of the Champa Kingdom between the 4th and 13th centuries and the spiritual origins are of Indian Hinduism. While not as impressive as Bagan in Myanmar or Ankor Wat in Cambodia, Mỹ Sơn has its own unique charm. The lush vegetation provides a vibrant backdrop for the ancient brick buildings. The preserved archeological site is small but easy to walk around in a few hours. And the loop trail is fairly flat. But be sure you get to Mỹ Sơn early to avoid the crowds and the heat. Or bring an umbrella to shade you from the harsh midday sun. The darling town of Hoi An is just a short 45 minute drive south of Da Nang. If you’re short on time you can just go for the day but we would absolutely recommend spending a few days in this quaint town. The pedestrian-friendly downtown area is filled with historical buildings painted a vibrant yellow and colorful lanterns hung from every tree. You can get a tour of the old town on a cyclo and then once the sun starts to set you’ll love taking a short boat ride on the river. The old city really comes alive in the evenings with people filling the street and colorful lanterns lighting up the entire area. It’s very crowded, especially on the Cau An Hoi bridge and throughout the night market. Asia Park is owned by the same company that operates Sun World so you can expect a similar amount of fun for the whole family. There is an amusement park full of rides and attractions that kids of all ages will love, beautiful gardens, interesting architecture, and plenty of dining options. You can spot the giant ferris wheel from pretty much anywhere along the riverfront. 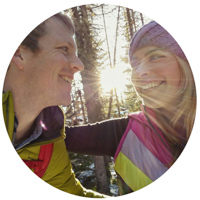 It’s a highlight of the park and definitely worth checking out for the views from the top! The Hai Van Pass is famous for many reasons – cultural, historical, and geographical. Plus it’s arguably one of the most beautiful coastal routes in all of Vietnam. The most popular way to see visit the mountain pass is to rent a motorbike and cruise up the winding road on your own. The views of the bay from the very top of the mountain are absolutely spectacular. Plus there are plenty of quaint stops along the way to rest and enjoy an iced coffee with the best views! If you are looking to explore the underwater beauty that Da Nang has to offer, you’ll want to book a snorkeling tour at Cham Island. It’s actually a cluster of 8 islands where you’ll find gorgeous beaches, amazing diving and snorkeling, and delicious seafood. The crystal clear turquoise water is home to vibrantly colored coral and marine life. For spectacular sunset views of the city, head to Sky 21 Bar on the rooftop of the Belle Maison Parosand Danang Hotel. Cocktails are pricey by Vietnam standards but you’re paying for the view, not the drinks. Brilliant Top Bar is a great place to go in the evenings for cocktails, city views, and entertaining live music. If you head to Zen Rooftop Lounge a bit before sunset you can take advantage of their happy hour drink specials. We hope this guide helped you to prepare for your trip to Da Nang! Next Post Planning a Trip to Vietnam? Don’t Miss These Highlights!